Syrian refugees crossing to Slovenia Jump to media player Refugees are crossing through a gap in Bregana on the Croatia-Slovenia border. Croatia-Slovenia 'looking porous' Jump to media player Thousands of migrants are expected to try to cross from Croatia into Slovenia, as Christian Fraser reports. 'Closing borders deflects migrant problem' Jump to media player Croatia's ambassador to the UK says a more 'humane' solution is needed to deal with the numbers of migrants entering Europe, rather than closing borders and building fences. 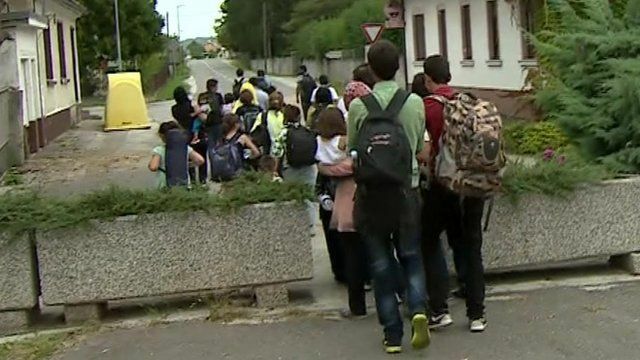 Hungary migrant action 'unacceptable' Jump to media player Hungary is criticised for using tear gas and water cannon against migrants trying to enter the country, as Nick Quraishi reports. Why Germany still welcomes migrants Jump to media player The German chancellor Angela Merkel has called on other EU states to show spirit and unity to resolve the migration crisis - as Germany continues to welcome migrants. More than 14,000 migrants and refugees have arrived in Croatia. Many are heading to Slovenia which is part of the EU's free movement agreement. Christian Fraser reports from Bregana on the Croatia-Slovenia border.